Unique mini bikes - the chopper. The custom mini chopper follows on from the mini bikes popularity. As with any bike type a custom edition is always close behind. So do you want to buy a custom mini chopper ? We took a look on the internet to see what stores and sites offer great deals. Our first port of call was westcoastminichoppers.com. They offer Mini Choppers and accessories, including frames, forks, fenders, wheels, dead axle hubs, engines, clutches, rear axle kits, billet aluminium spinger front ends and mini chopper plans too. So lots to choose from, plus they offer quality rigid rolling chassis kits to build the kind of chopper you always wanted. They use in house fabrication and you can specify your own rake and fork length so this truly is a custom mini chopper service. The chassis was available for $449.99, this comes with a 9” wide rear heavy gauge steel rear fender, and a show quality front 144 spoke rim and tire assy. From the images these do look like quality bikes. Also available are mini chopper plans for $9.99, including tube bending plans with step by step instructions. 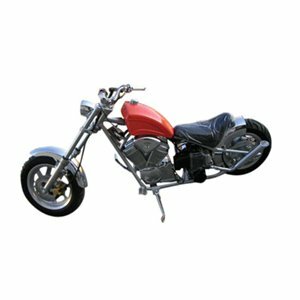 Although the stores we discuss below are not selling specifically chopper "dirt bikes", they do offer possibilities and ideas for building your own chopper dirt bike, using the plans and developments of "road type" mini-chopper bikes. We then went over to rnrfabrication.com, which advertise a line of Ronin Cycle Parts, and carry a full line of parts for your mini chopper project. They also offer Lifan engines including electrical accessories ie: lights and switches and handlebars and levers etc etc. We didn’t see any pictures or much in the way of descriptions, so it would be best to check with the site as to what is available. As it may be on a customer by customer basis; but they are sure to help on custom mini chopper ideas. The next website was hardcoreminichoppers.com. This site lets you buy mini chopper plans for $30. The plans are all converted into adobe format and on easy to read sheets, so ideal for the mechanic inside you, or perhaps a gift for those wanting to engage in such a project. This page has a great custom mini chopper for sale. With a 49cc, 4 stroke engine, a 7 litre oil tank and an electric and foot starting combination. The rear brake is a drum brake, with a front hydraulic spring. The bike does have a max speed of 70km / h, with a max load of 100kg. It was just a pity that no price was mentioned but the chopper from the picture did look impressive. There is also slaughterscustomshop.com, which is a proper custom shop and will be expensive. They can do a lot of custom quality work for cars and bikes, but many casual mini bikers might find this excessive, unless you need small custom items made. This shop is at the top-end and their custom work is undoubtedly some of the best custom work we have seen - but this all comes at a price. For used buys try - http://used-bikes.vivastreet.co.uk. Where we looked at a Dream Chopper Motorcycle, which although on the used bike page, was a brand new chopper mini bike. It had a 150cc street legal chopper engine, with a chrome engine case, valve covers, exhaust pipes, fork and rims. The chopper had an oversized low profile rear tire to get plenty of grip on the road and a manual transmission drives a double chain system. This could be considered a well thought out bike. The site is better than most too with good pictures and descriptions. Even for something as specific as custom mini chopper buys, you can see there are many sites offering amazing purchases and offers. A lot of custom mini bike choppers are popular by many young riders. A chopper mini motor bike has uniqueness and stands out from the crowd. 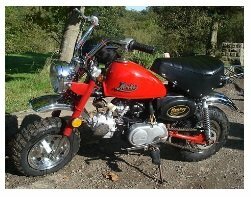 There are so many variations on building a chopper mini bike that many are custom built for their owner. But do get in a professional to complete wiring mini bike choppers you have bought; and particularly the brakes need to be correctly fitted before running the bike on the highway. By the way, once you have your ride, it's time to get fit and keep track of your training schedule. This will allow you the greatest advantage in your biking experience.